t*rexes and tiaras: How much is that doggy in the window.. I think that the only good thing about the change of seasons, so far, is that I have had the chance to wear some of my long-forgotten tights. I've been doing some spring cleaning style tidying up jobs, and have recently been through my tights and outsorted any which are pulled or holey, and organised the patterned ones so that they're labelled using sandwich bags, so that I can find the pair I'm after without having to unroll every pair and check them. These ones are pretty cute; they've got tiny dogs printed on them and I liked the way the purples and blues matched these Irregular Choice sandals. Which always make me think of that animated Xmas cartoon, The Snowman, where they're dancing at the North Pole. I'm sure the little character on the front of these looks just like one of the dancing party guests. 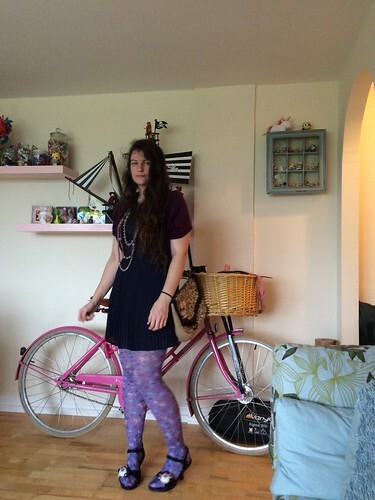 I went for a fairly low-key navy dress and a purple shrug to complete the outfit as I thought the tights and sandals were probably loud enough. Not that anyone who knows me would bat an eyelid anyway. Thanks, I can't remember where they even came from.